Once the chalet developments were left behind, a leisurely gondola ride over a peaceful scene of pine forest and alpine meadow brought me up out of the valley with constant views of the Eiger and the surrounding Oberland summits as a backdrop. On arrival at First, the air is filled with the sound of cowbells - I wonder if the sound annoys the creatures? I suppose they get used to it. The way ahead followed a wide track clearly marked for Bachalpsee and the Faulhorn and wound steadily higher through the pastures. The Sun was becoming quite hot as the day progressed so I stopped at a suitable rest rock and packed away my jacket which was no longer needed. I presently arrived at the Bachalpsee which turned out to be a pleasant tarn of exceptionally clear water in a fine mountain setting. Shoals of tiny fish swam near the shore but I couldn't see anything bigger. That famous view looking back across the tarn towards the Schreckhorn is well worth the walk up and is best seen from the far side of the lake though today it wasn't dead calm so no mirror effect! Not to worry - still a great view. 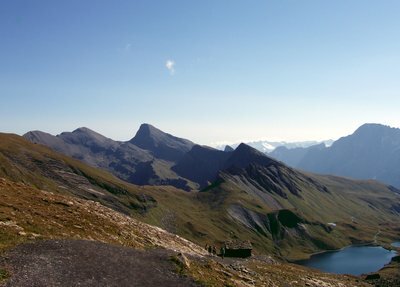 The aim for today, the Faulhorn, in the other direction was looking somewhat nearer than from First, the Berghotel clearly visible just below the rounded summit. Heading past the tarn, the way steepened considerably though was still wide and without difficulty. Passing the small Burgener Hut the gradient eased for 10 minutes before steepening again as the path wound up beneath the crags of the Simelihorn which towered on the left. The pastures became much rougher and stonier and the ever present sound of cowbells began to fade below as I reached the last push up to the Gassenboden Col passing another little hut I think was called the Reeti Hut. Turning right at the col the view now opened out with extensive vistas over the other side of the range to Lake Thun, the distant plains and the rest of the Oberland summits to the West. The summit was a final few zigzags of the path and passing the hotel buildings 2 hours after leaving First, I was greeted with a truly fantastic panorama all around. 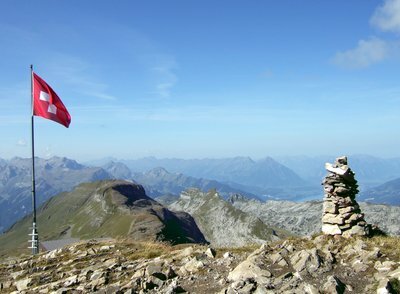 The cairn itself was perched on a dizzy edge with the turquoise blue Brienzersee appearing over 2000m below. Time for lunch! That was good, most of the people up here had opted for the hotel terrace so there were only 2 or 3 of us milling around up here and I had one of the benches to myself for a bit facing the Jungfrau , Monch and Eiger across the Grindelwald Valley. One last look around and I headed back down, this time turning right at the col down the other side of the mountain. This way led to a place called Bussalp where I'd be able to catch, yes, a bus, back to Grindelwald, (well we are easywayup.com and it would be rude to do an unnecessary road walk!). This route was quieter - I saw 2 people all the way down - steeper and rougher than the way I'd come up but nowhere was it difficult and was marked with red and white paint marks for its duration. Altogether it was a better way than from First although I did like Bachalpsee and this route would take much longer to ascend. After descending through a wild looking high valley, I came out above the Alp hamlets of Oberlager and was back on a wide track which led down to Bussalp and yes , I was just in time for the bus back to Grindelwald! Here are the rest of the photos from the Faulhorn trip.